Development cooperation flows from government providers outside the Development Assistance Committee (DAC), the most important club of aid donors, quadrupled between 2000 and 2011, while DAC aid doubled. 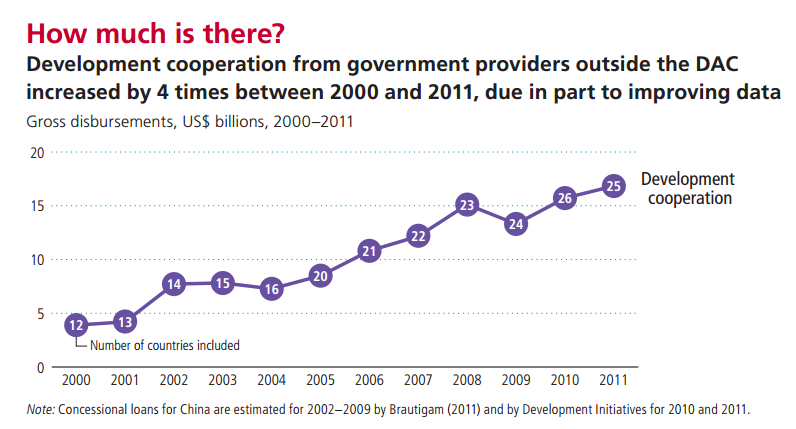 Non-DAC governments provided 10% of global development cooperation from official sources in 2011, the largest share since 2000. China was the largest provider and gave estimated US$5.6 billion, comparable to ODA from Canada, the fifth largest DAC donor and Saudi Arabia, the largest Arab donor. In 2011, the Middle East and Africa together received 75% of bilateral flows from these countries, due to large disbursements by Saudi Arabia and China respectively. Saudi Arabia disbursed 93% of its bilateral aid to the Middle East, and the United Arab Emirates 44%. Brazil gave 68% of its funds to Latin America and the Caribbean. China and Turkey are exceptions, as China gives mostly to Africa,Turkey gives mostly to Asia but also to countries in other regions. The development finance landscape includes now many developing countries. For example, of the 80 countries that reported their humanitarian assistance to the UN Financial Tracking System in 2012, 50 were also recipients of aid. Turkey was the fourth largest donor of humanitarian aid that year. As countries like Brazil, South Africa, India and others, Turkey is both a donor and a recipient of aid. China has achieved the largest reduction in the number of people living on less than $1.25 a day in the world: from 446 million people in poverty in 1999 to 157 million in 2009. Similarly, Brazil has made great progress, decreasing the number of people living in poverty from 20 million to 12 million over the same period. 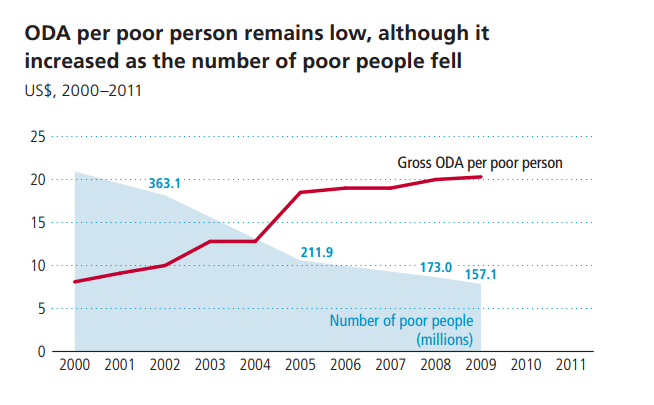 India remains the country with the highest number of poor people, around 400 million in 2010.